Happawana lies east of Galle on A17, the road that leads to Imaduwa and beyond. Three other villages surround Happawana””‚Bogahamulugoda to the northeast, Annasiwathugoda to the northwest and Meepe to the south in the Habaraduwa Division of Galle District. 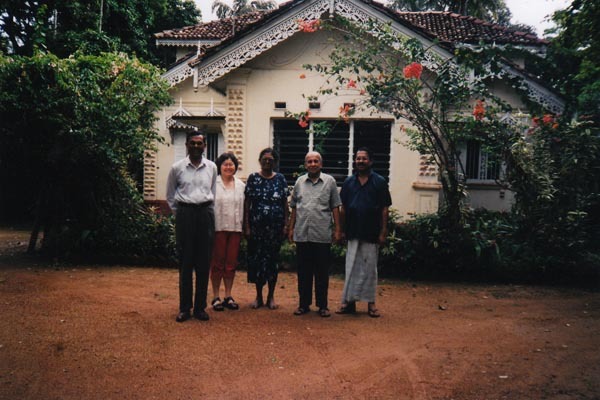 “Somagiri,” a house built on a hillock to the left of the road as you walked south, was my older sister Rani’s home at the time I returned to Sri Lanka on a summer assignment in 1993. It became my operational headquarters in the first month of my stay. As a professor teaching in an American university, I enjoyed a high degree of academic freedom. Although I was a tenured professor, my annual contract engaged me only for the nine-month school-year. I could take off the entire summer and work at another job (e.g., as a journalist, consultant, laborer or whatever) for my self-improvement. I could not do that in Malaysia or Australia, both of which had inherited the British academic system. University of Minnesota’s Student Project for Amity among Nations (SPAN) selected me as its 1993 adviser to “Yankee Doodles” Kendall Lakoduk, Kerry McCue, Corey Mireau and Michelle VanGorkom who chose Sri Lanka (the metaphorical “town” in the ditty) as their venue for research. Theirs was a brave choice because they were fully aware of the (Tamil) Tiger-initiated bombings that deterred many outsiders from visiting the country. A photograph of the Sri Lanka group taken during the SPAN orientation on April 17, 1993 (published in the Daily News on June 26), shows five students posing with A. A. Wijetunga, minister attached to the Sri Lanka Embassy in the U.S.; Patrick Mendis, a Sri Lankan scholar; and me. The fifth, Clair Olsen, probably decided not to come after she learnt about the assassination of President R. Premadasa on May 1. I had to drive the 250 miles from Moorhead to Minneapolis on several weekends beginning Nov. 21, 1992 (SPAN Day 1), and continuing on Jan. 9, 1993 (SPAN Day 2), Feb. 27 (SPAN Day 3) through April 17 (SPAN Day 4) to conduct workshops to acquaint the students with the political, socio-economic and cultural facets of Sri Lanka. Wijetunga and Mendis talked to the students on the last day of orientation prior to departure. On May 16, I joined the SPAN 1993 Bon voyage Banquet at Nicklaus’ restaurant in Minneapolis, where participants played skits. The four “Doodles”””‚Lakoduk, McCue, Mireau and van Gorkum””‚too had arrived on the island early June to conduct their individual eight-week projects. (In contemporary times, the Yankees appear to have substituted airplanes for ponies!) As agreed upon, I had my first meeting with them on June 12 at the Mount Lavinia Hotel. I was their host for lunch at the hotel’s Curry Clipper restaurant. I cannot remember whether they wore caps with feathers stuck in them. But they had their swimwear ready for a dip into the sea waters of the world-renowned Mount Lavinia Beach. The second Mahadenamutta session with my American “pupils” was at my Happawana headquarters on Sunday, June 20. I sent my nephew Niraj to meet them in Galle and give them directions to the village. They arrived just before 8 p.m., having spent the previous two days in Hikkaduwa. The news of the arrival of the Americans in Happawana had spread in the village like wildfire almost an hour before they came. Word-of-mouth was more powerful than any mass medium. Imagine Mireau and VanGorkom crossing the rice paddy a-riding on a motor cycle, rather than a pony with the villagers gawking at them with friendly amusement. McCue and Lakoduk walking along the gravel road with their backpacks also might have been the cynosure of prying eyes. We entertained the four SPANers with local treats and a sumptuous dinner. Several villagers, including Sathya Dayaratne, dropped by to ostensibly chat with me until close to midnight but actually to get a glimpse of the “Yankee Doodles,” who were going to stay with us overnight. My son Junius and nephew Niraj took the four foreigners on a tour of the village next morning. The villagers had an eyeful of the aliens to satisfy their curiosity. They returned for a Happawana-style village lunch to remember for the rest of their lives. Then Corey and VanGorkomgot on their motorbike to return to Hikkaduwa while McCue and Lakoduk took a bus trip back to Colombo. My third Mahadenamutta session with the four SPANers was scheduled for the weekend of July 31 in Kandy, after I returned from a two-week tour of Australia. My son and I took the train from Colombo to Kandy, where we found the “Yankee Doodles” waiting for me at Queen’s Hotel since noon. They were delighted to be in Kandy to see the famous Randoli Perahera (procession). Our hosts in Kandy were the family of Uncle Ruberu whose home was at 27 Katukelle Lake Road. We watched the perahera that evening and ate a late supper before retiring to bed. The annual perahera“”‚”a procession of gilded elephants, palanquins, saffron-robed monks, drummers, and chanters mov[ing] majestically to the Temple of the Tooth in Kandy, where Buddha’s tooth is enshrined” (as described in the Encyclopedia Britannica)””‚was a treat for the eyes of the young “Doodles.” The performance of the famed Kandyan dancers, a glittering attraction of the perahera, provided them a remarkable cultural experience. The SPAN students visited me at the Ruberu home Sunday morning. I introduced them to our hosts. Mireau and VanGorkom left after a while to move from one guest house to another while McCue and Lakoduk decided to lodge with us. They each had paid Rs. 1,000 for a seat to watch the perahera at close range. My son and I joined the families of Wimal Kotmale and Sarath Ruberu to watch the grand finale of the Randoli Perahera that evening despite the rain. The two Americans joined us for a late dinner at 11.30 p.m. They left us early Monday morning to see the elephant orphanage at Kegalle. “Sri Lanka: the isle of gems” by Corey Mireau. They ceased to be my “disciples” after they got the grades for their Sri Lanka projects. On the last Sunday of June, my son and I boarded the Ruhunu Kumari (the train dubbed Princess of Ruhuna) to visit Colombo, so I could meet with the University of Colombo officials regarding the “consultancy” with the Journalism Unit arranged through Ananda Guruge, the Sri Lanka ambassador in Washington, D.C., in consultation with Vice Chancellor G.L. Peiris of Colombo University. We found a relative of ours, police officer Kirthi Gajanayake, who agreed to drive me to Mount Lavinia to visit with (former news editor of Daily News) Harold Peiris. We stayed overnight with the Gajanayake family. The next morning, Gajanayake gave me a ride to the Colombo campus. On campus, I met with the registrar, Nissanka Warakaulle, who turned out to be a contemporary of mine at Peradeniya. He arranged for me to stay at the university Lodge for a month beginning July 22. I also met with Professor H. N. C. Fonseka, dean of the faculty of arts, and Professor G. D. Wijeyawardene of the department of Sinhala to discuss what I could do to help the Journalism Unit. Fonseka said I could have “study facilities” with no official “consultancy” involved. Wijeyawardene said we should meet again on July 22 to work out a schedule. After visiting the campus, I took a bus ride to Lake House, where I met with Observer editor H. L. D. Mahindapala, Daily News editor Manik de Silva, N. R. J. Aaron and other journalists. I ate lunch with Mahindapala and his wife at their apartment. Gajanayake brought my son and me to the Maradana railway station to board the Ruhunu Kumari and return to Happawana that evening. During our stay in Happawana, my son and I spent many afternoons exploring the rustic beauty of the village. One afternoon, villager Dayaratne Paranavitana (alias Gunasekera) joined us to climb the Amugodawatte Hill from where we had a good view of the Koggala Oya and the surroundings. On the way back, we chatted with all and sundry. Photo (attached): The writer’s “ƒ”¹…”headquarters’ in Happawana””‚the home of his older sister Rani (middle). The writer and his wife Yoke Sim flank Rani on the left while her husband (Happawana Aiya) and his younger brother (Sudu Mahattaya) are on the right.